Crespi d'Adda is a late 19th century model worker's village. It is one of the best preserved examples of the phenomenon of "company towns", which were developed by enlightened industrialists in Europe and North America. The aim was to house factory workers close to their work and the raw materials. 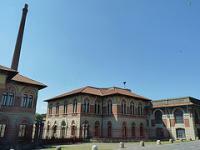 The urban layout of Crespi d'Adda and its architectural appearance are still unchanged. The town was founded in 1878 by the textile manufacturer Crlstoforo Benigno Crespi, who build a number of houses for his workers around a mill. His son, Silvio Benigno Crespi, turned this into a village based on an in ideological model. Besides single-family houses, with their own gardens, he constructed common services like a school, a theatre and a hospital. Reading the previous reviews, I was expecting a desolate WHS in decay. When I arrived however on a sunny Sunday morning, the town looked bright and I certainly wasn’t the only visitor. Local people streamed out of the church, a service had just ended. A group of photographers was trying creative shots of the tree lined streets and the industrial buildings. And numerous people were using the streets (that are low on traffic) for jogging or cycling. I parked my car in the town center and went out to explore too. The main attraction is the former factory. It’s an iconic sight (see larger picture above), architecturally interesting. Unfortunately the building is closed, and no effort has been made to turn it into something informative about its past. 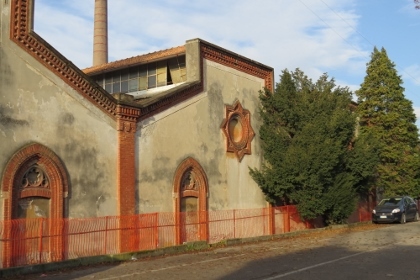 I wonder what the new owners of Percassi will do about it – they seem to want to house their business headquarters in the factory buildings, but will that mean these buildings stay closed for tourists? In all I wandered around Crespi d´Adda´s streets for about an hour. The church and school are worth a look, and I even walked uphill to try and get better views of the factory owner´s palace. The design of the town was inspired by English examples, and certainly Saltaire springs to mind. The rigid street plan and the cubical houses are similar. This Italian version however has more flair. The houses aren´t so close together, are painted different colours and all have good gardens. The church is a pretty thing, and most of the other communal buildings seem to have been designed by a creative architect. 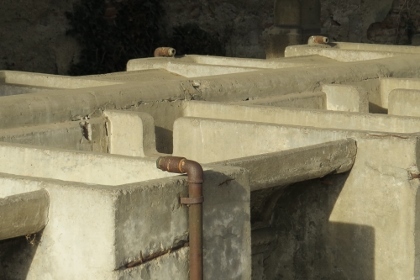 A final interesting feature is the outdoor laundry place in the town center, which was made to save the inhabitants the walk to the river for washing clothes. I made a last-minute decision to visit Crespi d'Adda because I had arrived quite early in Milan from Modena and had a few hours to spare before my flight home from Malpensa. It took me quite a long time to get there because it was a Sunday and the buses only go once an hour from outside the Gessate Metro Station. From Trezzo sul Adda, it is quite a long, but reasonably pleasant walk to the site - you can download a map from the site of Crespi's tourist office. I only had about 30 minutes or so before I had to take the next bus back, so I could only take a quick look around, but I had the impression that this was sufficient. There is really not a whole lot to see, just a few private and public buildings, and not much in the way of signage or explanations. The factory and the church are somewhat impressive (as is the owner's villa in the park that can be glimpsed through the trees), but nothing really special. I guess Crespi's inscription is justified because of its value as a company town, but from a tourist perspective, it doesn't offer very much (and on a Sunday afternoon, the place was practically dead). I visited this WHS in August 2013. It is definitely not the best WHS in Italy and most certainly not the most visited one either. More should be done to raise awareness on this site on a national level and to make it more accessible/interesting. I drove to Capriate San Gervasio to visit Crespi d'Adda. I arrived early in the afternoon on a sunny August day and pretty much everything was empty and closed (including Crespi Cultura which was supposed to be open!). The site is not looked after especially since the textile factory closed down. There were broken windows, signs of vandalism, overgrown grass on the pavement and the main road leading to the factory is blocked since some of the buildings are falling down due to lack of maintainance and therefore it is not safe for pedestrians or motor vehicles to keep it open. There aren't any information signs apart from the UNESCO sign just before entering the village and a small sign just next to the closed factory. The main church (replica of Busto Arsizio) is well kept as is the School nearby, and a short walk uphill next to the biggest villas gives you a good view of the urban layout. I'm not a big fan of industrial sites although there are pleasant exceptions such as Salins-les-Bains or the Woudagemaal, however Crespi d'Adda desperately needs funds and enough political will to maintain the site, install more informative signs and if possible open up the factory to the public on some days. As it is today, it doesn't deserve to be on the WH list and it certainly does not have OUV. Although the factories fell silent in 2003, the residential areas are still occupied and well maintained. The church, school and theatre are periodically open to visitors. 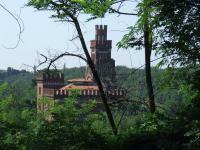 But the Villa Padronale, the castle residence of Cristiforo Crespi is not open. I reached Crespi d'Adda from Milan by taking the Matro to Gessate, then bus #Z310 to the terminus at Trezzo sul Adda. From there I crossed the bridge over the river to Capriate and followed the riverside road to the site. 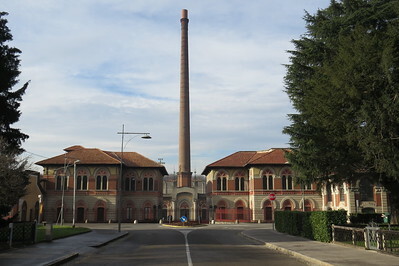 I have been once in the nice utopian company town of Crespi d’Adda, constructed from 1878 by the architects Angelo Colla, Ernesto Pirovano, Luigi Cavenaghi and Gaetano Moretti for the enlightened textile manufacturer Cristoforo Benigno Crespi to meet the workers’ need. 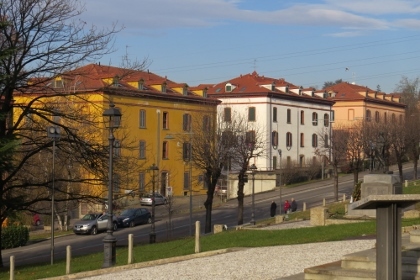 The town is in a geometrically regular form and it is divided in two parts by the main road from Capriate San Gervasio. On the right, on the left bank of the river Adda, is the single block of the factory, projected by Pirovano, with decorations in medieval style. It is divided in sections: twisting, spinning, weaving, dyeworks, steam engine, boiler, power station, storehouses and offices. On the left, are the houses of the workers, the foremen and the executives, constructed in a rectangular grid of roads in three lines, in original plans two-storeyed buildings for several families, each with four rooms, and now individual family houses with a small garden and a vegetable garden, the latter separating the houses from the lavatories in the rear. The earlier houses have different stylistic and layout grounds. On the main square there is the church, projected by Cavenaghi following Bramante’s Temple of Santa Maria in Piazza in Busto Arsizio (the home of the founder of the company) and built from 1891 to 1983, the school, theatre and minor palaces. The castle(Crespi’s residence) with the stables, projected by Pirovano and completed in 1897, recalls the Romantic Gothic period using the ceppo stone of Capriate San Gervasio, fired bricks and cement and is a mixture of Neo-Gothic Lombard elements, sculptures and paintings with Moorish elements from Veneto. The cemetery with the Crespi family mausoleum, projected by Moretti, is in Art Noveau style. In the town there are also a wash-house, a working men’s club, public baths and showers, a hospital, a hotel, a cooperative building, shops, the rectory, the doctor's house, a pinewood and a sports centre with a field. I quite liked this town because of the quality and originality of the architecture and also because I have never seen more important industrial sites, but there are some buildings not preserved well and the factory and many other buildings are closed to the public. It's worth to be visited if you are in Lombardy. It is one of the most important industrial towns and the most important in Italy and it justifies the inscription also because there aren't many indusrial sites on the WHL, even if I think that could be inscribed also the nearby hydroeletric power station (1906) in Trezzo d'Adda, projected by the same architects that worked in Crespi d'Adda for the same owner. A site dedicated to Crespi d'Adda.